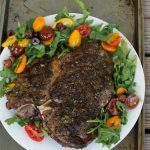 Grilled Porterhouse Steak Sicilian Style marinates the thick steak in a fusion of southern Italian seasonings then once it's grilled is served with marinated cherry tomatoes over arugula. Make a paste out of the Hot Italian Spice and the 2 Tablespoons olive oil. If you don't have a complete spice like the hot Italian, mix the 7 ingredients starting with the thyme and ending with the garlic with the 2 Tablespoons of olive oil. Rub the paste onto the meat, both sides. Place the meat on a plate and cover with plastic wrap. Refrigerate at least for 2 hours, preferable more. **Meanwhile, make the herb oil. In a small bowl, mix together the olive oil, lemon juice plus the zest, thyme, oregano, salt, and pepper. Remove the steak from the refrigerator 30 minutes prior to grilling. Preheat the grill to high heat. Sear until you reach your desired doneness, about 5-8 minutes for medium-rare. Your best bet is to use an instant read thermometer. 140 to 145 F. Place the steak on a plate and lightly tent with foil. This is very importatant!!! Let the meat rest at least 5 minutes but 10 is better. During the cooking process water comes out of the cess. If you cut the meat immediately, it will drain onto your cutting board or plate. Let it rest lightly tented with foil. The fluid will absorb back into the meat. Sprinkle the steak with the herb oil and serve with the marinated tomatoes over arugula. In medium size mixing bowl, whisk together the olive oil, balsamic vinegar, salt, pepper, basil, thyme, garlic, and crushed rep pepper flakes. Add tomatoes and gently toss to combine. Allow the tomatoes to marinate for 2 or more hours in the refrigerator. Bring to room temperature before serving.